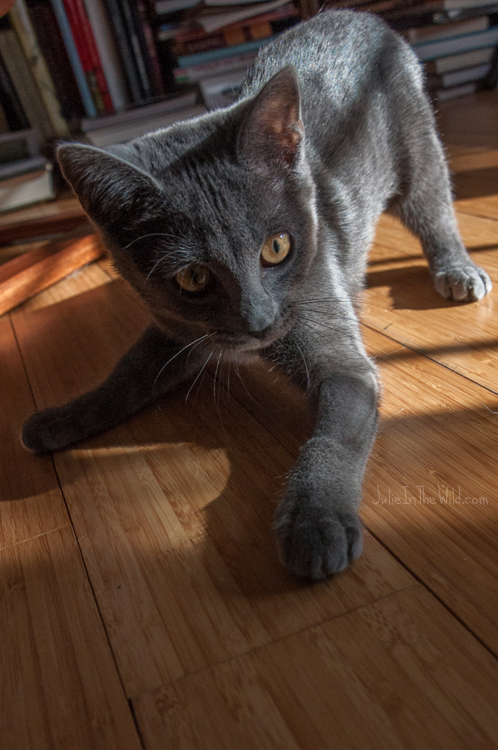 I mentioned in my last post that we've gotten a new cat- a grey kitten, and that the shelter had called her coat "blue" instead of grey. 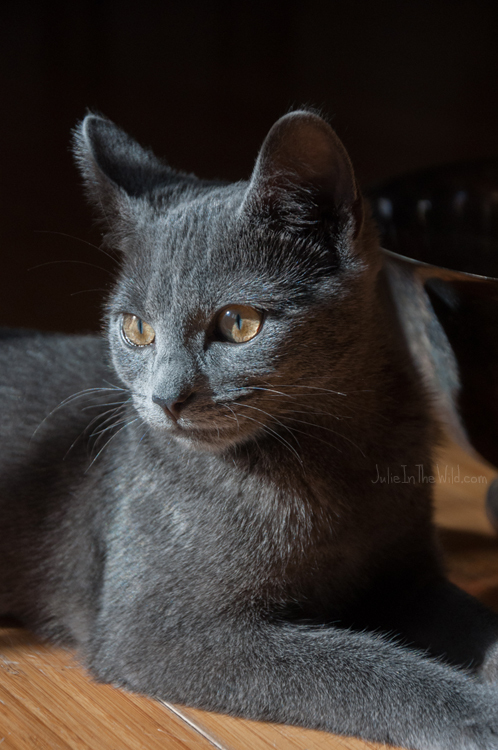 I know there are a few cat breeds that are called "blues", such as the Russian Blue, but when I asked the Googles why cat people chose that word instead of the more accurate "grey", I didn't really get an answer. Perhaps it was a marketing thing. Or maybe it has to do with the cool cast to the fur. Since choosing colors for paintings is important, how we perceive color is a bit of an obsession of mine. (yes, I've seen The Dress. Please lets not start that again) So even though the guys are thoroughly tired of my monologuing about the "temperature of different greys" and "translucent vs opaque fur" and how "different lights effect the perception of color through hair," I have not tired of the subject one bit. As a matter of fact, now I'm blogging about it so I can bore people on the internet with this topic as well. Well, sort of. I promise there will be cat photos, so at least you'll get that. 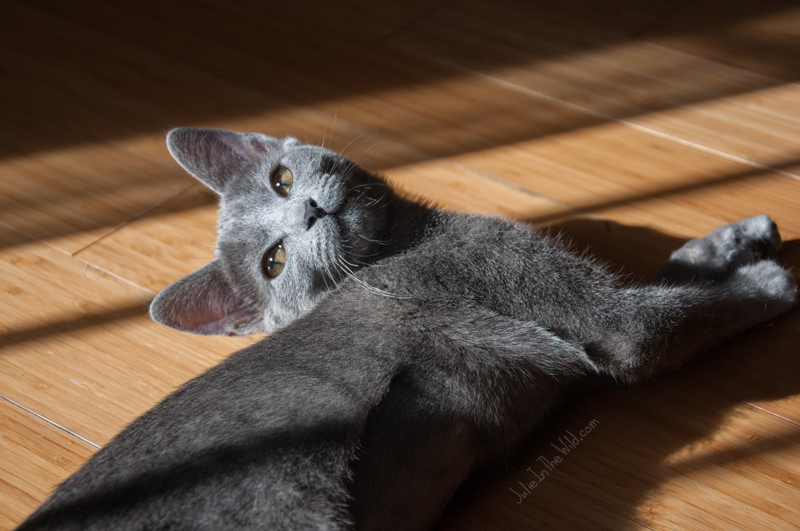 At first I thought that perhaps, because her grey fur is a "cool" grey, instead of a warm, the warm orange wood floors would contrast against her fur and make her look more blue. It was a good theory, and it might hold more water if her fur were opaque, but it's not, it's translucent, and that's not really what I was seeing. (Dear author and grammar nerd friends, please don't diagram that last sentence. Thanks.) After some more obsessive observation, I decided that because her fur is mostly translucent, it was acting more like glass would with the colors around it. In other words, there's a lot of reflecting and refracting going on. Allow me to illustrate with cat photos! All of these photos were taken with my dslr. Sometimes cameras get the color balance wonky, but I made an to attempt at an accurate balance. None of these photos have filters applied. First up, our bedroom, blue walls, blue blanket, lots of blue morning light- Valentine looks particularly blue in this room. Our kitchen is also painted blue, but the floors in there are orangey wood- and I wanted to show you guys the full effect of what blue light does to her fur. Valentine in the blue room, looking more like a fox than a kitten in this pic. Next up, is our front room downstairs with some early afternoon window light. This was the the best I could do to get a "neutral" light on Val in our house, the walls are fairly distant so there wasn't too much bouncing off of them onto her. Still, that warm wood floor effects her coloring quite a bit, particularly in the shadows- I'll get to that later. 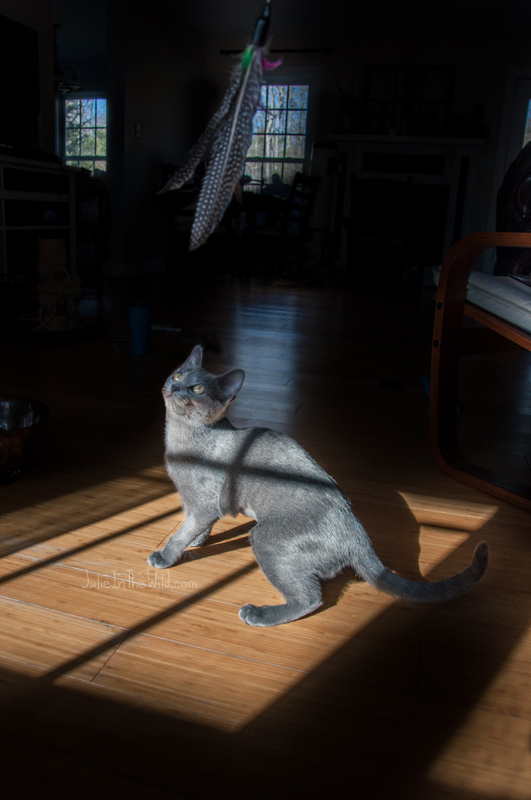 On the other end of the spectrum, and looking like a completely different cat than the Valentine in the first photo, here's Val in afternoon sunlight in our office, which is painted a chocolate color. Val's fur looks almost brown in here. If you're having trouble seeing what I mean when I describe Val's fur as cool, neutral, and warm, here's a handy little graphic I made with the three photos. I took a color sampling from each one to try to narrow the focus on specific colors. I tried to make each sample a local color of a mid-range value. The biggest challenge I had was photographing Val in a neutral setting. Maybe I could stick her in a white lightbox to get it perfect, but have you ever tried to wrestle a 4 lb kitten into a lightbox? I told her it was for science, but she was surprisingly uncooperative. I've taken samples of color from the top of Valentine's head, where it's in the direct sunlight, and from the shadows, where there is warm light bouncing off the floor. Just for the heck of it, I took more color samplings of this middle image to try to get a reading on what was happening here. The light hitting the top of Valentine's face has very little reflected color on it from the floor, and appears to be a pale blue. (The fur on her face is also less translucent than the longer hairs on her sides and throat.) In the shadows facing the floor, however, there's a lot of warm reflected light, making her fur there appear brown. All righty, so that explains what I'm seeing, but it doesn't quite explain what is happening. Not precisely, anyway. For that, I highly recommend this book by James Gurney. (If you click on my library link at the top of the page, you'll see it's one of my evergreen, always-reading books.) For a quicker perusal, and to get an idea of the kind of information you'll find in his book, check out James' blog. Particularly this post. And this. Also this one. Oh Em Gee, this one too. Look, just go read his blog. And buy his book. You said there'd me more kitty photos! FINE. Hit the gallery below for more pics of Valentine doing Valentine things.